A revolutionary playful exploration of traditional Yoga poses and Aerial movements using a soft hammock suspended from the ceiling. An exquisite experience. Find inspiration through new experiences. 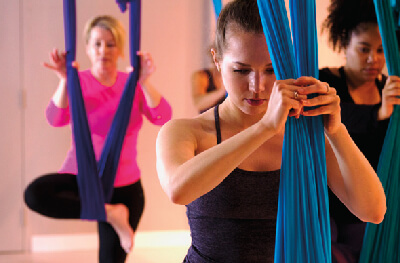 Discover a fulfilling, effective, enjoyable and calming style of Aerial Yoga. In every pose you’ll feel tension slip away. 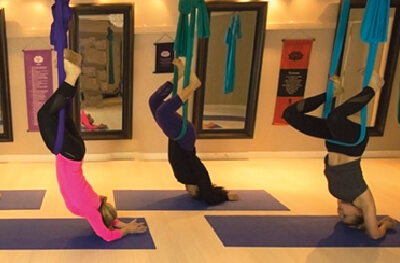 You’ll experience traditional Yoga poses as aerial adaptions. Side Effect ~ you have access to a stress management tool for any given moment. Your whole body will get an ‘extra stretch’ through traction and decompression. Acu-pressure is involved. An ancient self healing medicine. You can experience inversions with no compression on your neck! You’ll find it easier to move throughout the day. Enhances your regular Yoga practise. It’s an exciting and rewarding introduction to Yoga. As well as an enhancement to your regular Yoga. You get to play, explore and enjoy freedom in movement and stillness. Your hammock is a polyester knit fabric designed specifically for Aerial Yoga. The working load limit is 192 kg (425 lbs.). Breaking load is 1542 kg (3400 lbs). In other words: your body weight is fully supported. Trust your hammock, the hardware and the rigging. You are the best teacher for you! Listen, respect, connect and practise patience for yourself on and off your hammock. Commit to yourself and enjoy the progression. No jewellery, watches or other items that may tear the hammock. Wear short sleeve shirt and clothing that goes past the knees. Makes it more comfortable for your arm & knee pits. Arrive open minded. Leave open hearted. 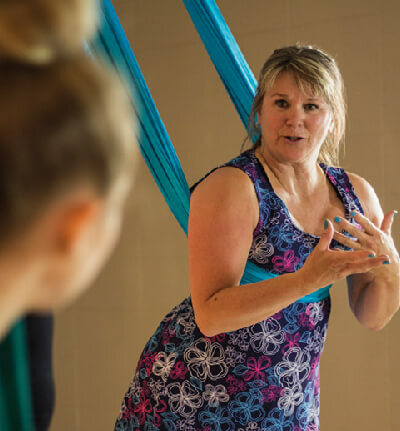 The style of this aerial yoga is ‘Air Yogalates’. Genevieve Berube & Marie-Michelle Faber are the founders and trainers. Two Canadians who perform for Cirque de Soleil and love sharing their professional knowledge.